It’s funny how this thing about discovering and sharing our family stories goes. I so much appreciate the prompting that Amy Johnson Crow gives us each week with a topic to write about. Sometimes, it grabs me right away and I immediately know who or what to write about. Other times, life gets in the way and there’s not an immediate connection, or there’s not a time to write, so I linger. This week was more the latter than the former. Too much business travel and no real idea about who was “Out of Place” made me procrastinate. Until this morning. I realized that there are lots of ways to be out of place. And one of those was to be in the wrong place at the wrong time. That’s just exactly what happened to Ira Thomas Higgs. Ira Thomas Higgs was the brother of my great-grandfather, John William “Will” Higgs. These last several weeks, I have talked about his parents, Thomas M. Higgs and Mary J. Sartain and what brick walls they have been, and how DNA has helped make a little progress in this family. But even in this family, Ira has been a bit of a mystery. Ira most likely was born in Alabama, Tuscumbia by most reports, in 1865, shortly before the family headed to southwest Arkansas. By 1870, he and his family are living in Washington, Hempstead County, Arkansas. Thomas is working as a shoemaker there. By 1880, Thomas (Ira’s father) has died and left Will and Ira to make their way. At 15, in the 1880 census, Ira is working as a printer with his older brother who has gotten into the printing and newspaper business. 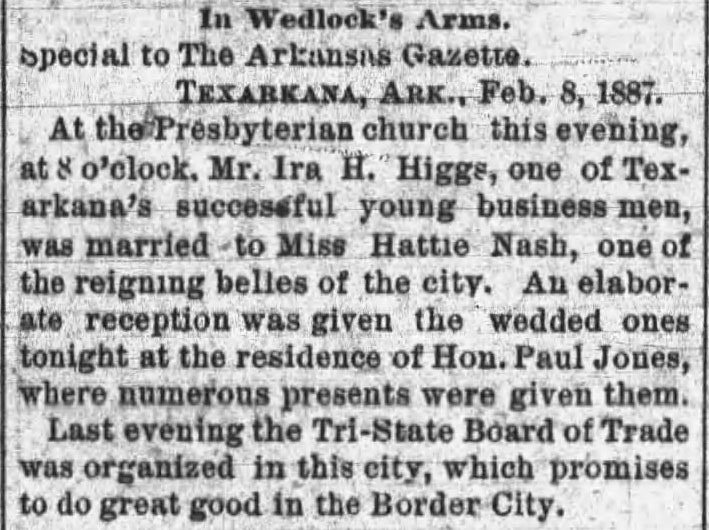 Sticking to the western part of the state, Ira and Hattie moved at least a couple of times – Mineral Springs, Texarkana, Hot Springs, and Alma. Sometimes this put him in the wrong place at the wrong time. Like in September 1891 when Ira got mugged while visiting nearby Fort Smith. Interestingly, that was first reported in the Weekly Argus published by Ira’s brother, Will. By 1902, Ira and Hattie had settled in Van Buren, Crawford County, Arkansas. In addition to his business dealings, Ira became the county coroner in 1902. It appears that sometimes his temper got away from him, like in this account of a fist-fight in 1903. Sounds like this had an affect on his business, whether from lost business, lost reputation, or lost money from fines. Don’t know the cause of the fight, but someone must have been in the wrong place at the wrong time. Ultimately, Ira’s life ended in a case of being out of place, in the wrong place at the wrong time. On the 18th of March, 1914, Ira had come over to Fort Smith from Van Buren. The two cities are only separated by the Arkansas River, so there’s a lot of business back and forth between the two. Apparently, he headed out to catch a street car home in the evening. He saw that the car that was coming wasn’t the one he wanted and headed back. But for some reason, he turned around quickly and headed back across the street and was hit by the street car. His leg was severed and his head was seriously injured. He died some hours later in a local hospital. Perhaps due to the severity of his head injury or perhaps due to his being out of his regular element, Ira was not immediately identified as the coroner in the next county, just across the river, until after his death. 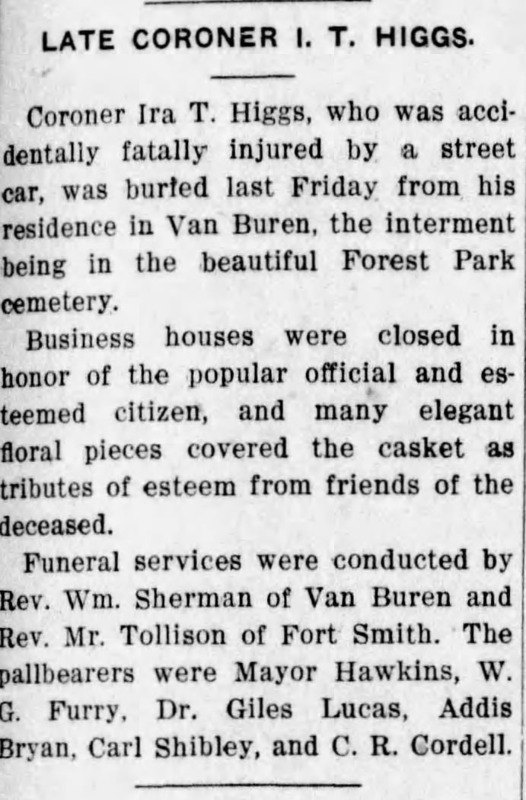 Ira’s death was covered across the state, not just in the large newspapers, but also in small papers in areas where he had connection – Washington, the town of his childhood, and Nashville, where he had lived, in particular. I’ve always wondered what really happened here. How did he step in front of the street car he just chose not to board? Was someone calling to him? Was someone warning him not to step in front of something else? Was he, maybe, somewhere he should not have been and wasn’t fully in control of his faculties? (That’s a nice way to ask whether he had been drinking?) Who knows. But, lying in the street and then in the hospital as a John Doe is certainly out of place. Interestingly, the newspaper in Nashville, Arkansas reinforced the DNA connection we found last week. It says that Bob Dennison is a cousin of Ira Higgs. Bob Dennison is a descendant of Susannah Sartain, sister of Ira’s mother. After his death, Ira found his way back across the river and home. His burial was reported in the Fort Smith Daily Herald and Elevator. It seems like there were a number of noted citizens present for his service. So, maybe even though he was out of place on that fateful day in March 1914, and even though a funeral for a forty-eight year old father and husband in the prime of his life is out of place, perhaps Ira had been living actually right where he was supposed to be .